Chandrasekhar was brought to Anand Hospital on Tuesday after his condition suddenly deteriorated while he was being detained by the police in Deoband. 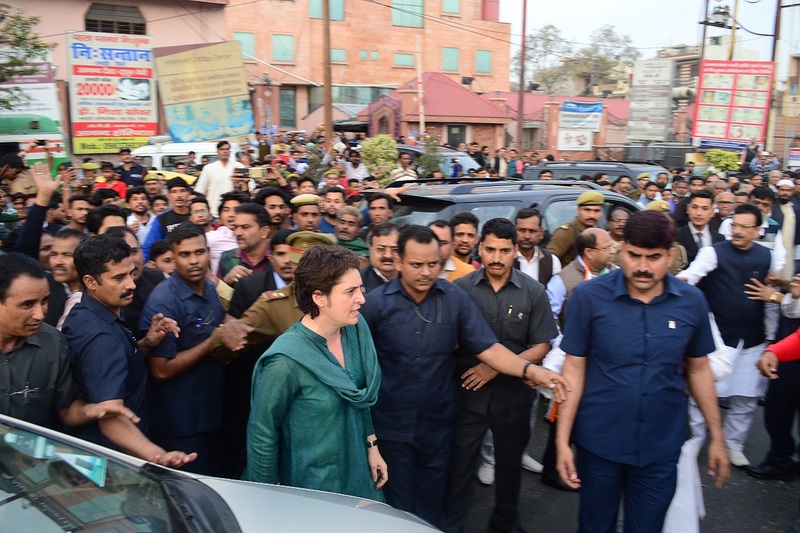 Congress General Secretary Priyanka Gandhi on Wednesday evening visited Bheem Army Chief Chandrashekhar Azad alias Ravan, who is admitted to Anand Hospital in Meerut. Accompanied by Jyotiraditya Scindia and UPCC chief Raj Babbar, Priyanka said that she appreciates the ‘josh’ and struggle of Chandrasekhar. In her interaction with the media, she said that her visit is not a political one and that she has come to inquire about the health of Chandrashekhar. “He is young, struggling and trying to raise his voice against injustice,” she said, adding that he is making efforts to become the voice of the poor and downtrodden but the state government and the central government are trying to crush his voice. Taking on the government, Priyanka said that this government is egoist and is trying to crush the voice of the youth. “They are not giving employment to youths and when they are raising their voices they are trying to crush them,” she quipped. When asked if her party would give a Lok Sabha ticket to Chandrasekhar she answered in negative. Before leaving, Priyanka asked the media personnel present there to remain calm and not disturb the patients at the hospital. It may be noted that Chandrasekhar has passed on a clear message of contesting election against Prime Minister Narendra Modi from whichever constituency he would contest. In a video posted by him on the Facebook page of the organisation on Wednesday afternoon, Chandrasekhar claimed that only he had the capability to send Modi back to Gujarat and defeat him in the upcoming elections. But, this visit by the Congress general secretary has raised a few questions.